It’s fair to say that the airline industry in general has been experiencing a bumpy ride in the media over the last few months. This, however, offers lessons on how to handle a crisis. Unwanted media attention does not mean that social media efforts are to no avail. Airlines can still find ways to delight their passengers with engaging content. The airlines included in this report both have a larger audience size and experience a higher growth rate on Facebook, followed by Twitter at a distant second. Growth on Instagram is surging, but with an average audience that is just 15 percent of Facebook, Instagram needs to sustain this growth for years to catch up. Pinterest has become an “also ran,” with just a handful of airlines maintaining any presence there. LinkedIn is a strong contender for audience size and growth, as the fourth most popular social network. All but two airlines maintain an active social presence here. On average, airlines are publishing 6 to 7 pieces of content every month, leading to an audience growth of nearly 25% in 2016. Airlines overwhelmingly prefer Twitter to publish brand content (which does not include replies and retweets). However, airlines do not see much return from the social network when it comes to interactions generated per piece of content. Instagram provides a more fertile ground for high engagement. For each post on Instagram, airlines received 15,296 interactions – 8.5 times higher than Facebook. So airlines would do well to focus and ride on Instagram’s organic growth. In terms of brand damage, few things are worse than dragging a passenger off the plane. Two months after the PR crisis, and with subsequent follow-ups by the CEO (which the media believed added more fuel to the fire), it seems like the incident wasn’t quite the death knell that many had predicted. As of the end of May 2017, United’s share price rose to an all-time high and user interactions fell back to pre-March 2017 levels, suggesting that the crisis was well behind them. 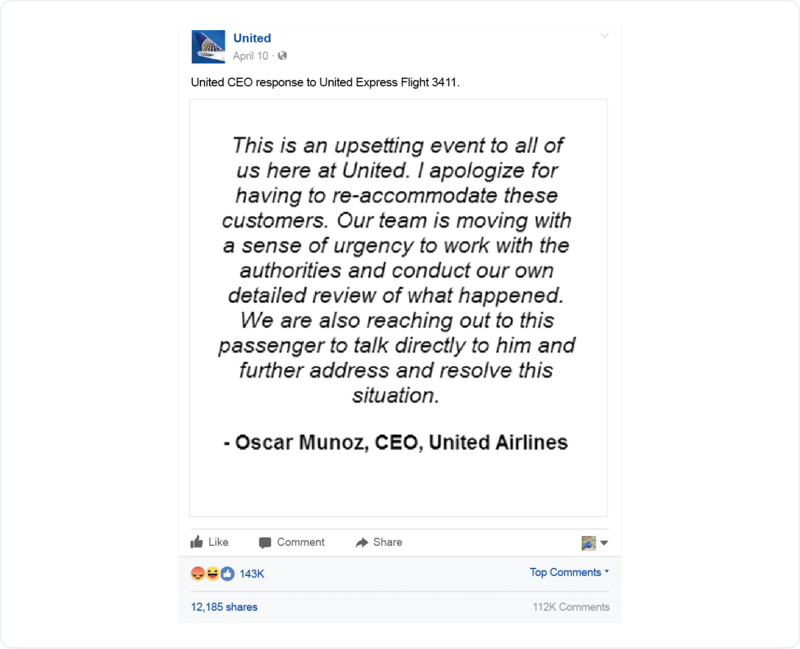 The day after the incident, United’s CEO released a statement which many believed fell short of the type of apology required for such a case. Users on Facebook left over 130,000 comments on this post, making it one of the most commented brand posts ever. Over 143,000 people ‘reacted’ to the Facebook post, and 90% of them with the ‘angry’ emoji. 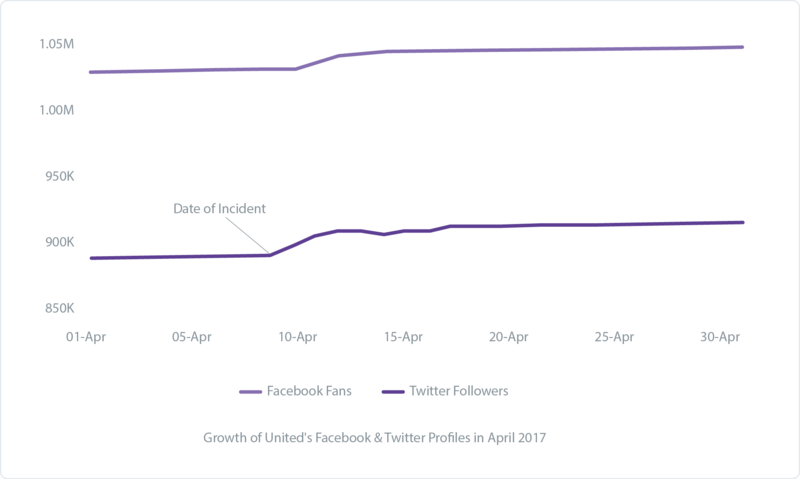 The fallout from the incident was immediately apparent on Twitter, when a spike in followers on April 9th coincided with a spike in user mentions. Facebook took another day to see a reaction from users, with fan numbers spiking on April 10th. In total, United added approximately 14,000 new Facebook fans and 20,000 Twitter followers in a span of ten days. Under normal circumstances, United Airlines adds this many followers in around two months. Social media has given people a voice to tell a brand what they think and this is rarely more apparent than during a crisis. In 2016, United Airlines generated an average of 131,000 user interactions across Facebook, Twitter and Instagram. In April 2017, United saw over 647,000 user interactions, nearly five times higher than average. Of all the user interactions in April 2017 for the airlines featured in this report, United’s share was 19 percent. In 2016, United Airlines averaged around 43,500 user mentions on Twitter every month. This placed it third in overall mentions, behind American Airlines (69,500) and Delta Air Lines (68,500). In March 2017, user mentions spiked for United Airlines when they refused to allow two young passengers who had to board a flight due to a violation of dress code. In April 2017, the number of mentions for United on Twitter almost exceeded the total number of mentions Delta Air Lines received in all of 2016. United was involved in nearly 70 percent of all user mentions of the fifteen airlines featured in this report. 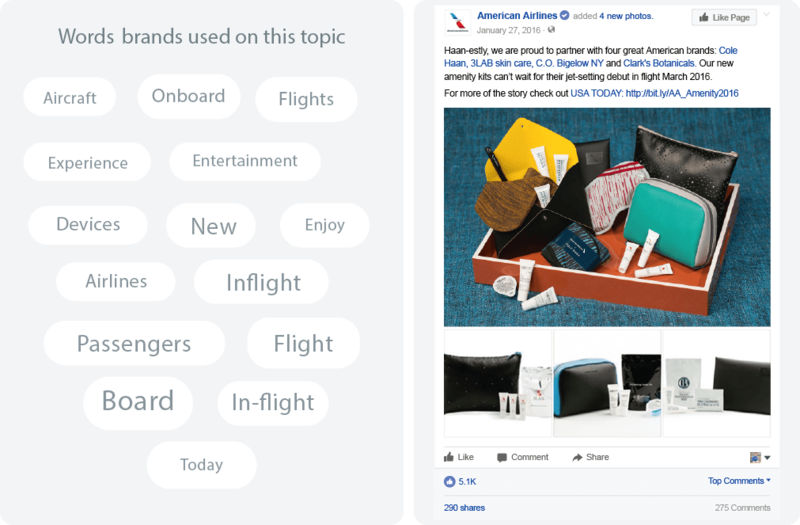 Using Unmetric Discover, a searchable database of over 500,000,000 pieces of brand content, the following topics were found to be the most popular talking points for airline companies. Promotions and contests form a central pillar for most airlines’ content strategy. The reason is simple: it works. WestJet’s inspired contest to get people to tag friends got over 25,000 comments. Highlighting on-board amenities tended to be hit or miss for many airlines. This organic post from American Airlines about its new amenity kits was a definite hit with nearly 300 people sharing it. Business class travel is of utmost importance for airlines, so it’s little wonder that so much effort goes into creating content to promote it. There were plenty of topics to talk about around business class travel, as the word clouds show below. Business class is where the money is so it’s no surprise that airlines focused a lot of their content on this service. United put a large amount of effort (and paid promotion) into the launch of their Polaris Business Class service, generating huge engagement. The fourth most popular topic for airlines was the Business Class lounge. 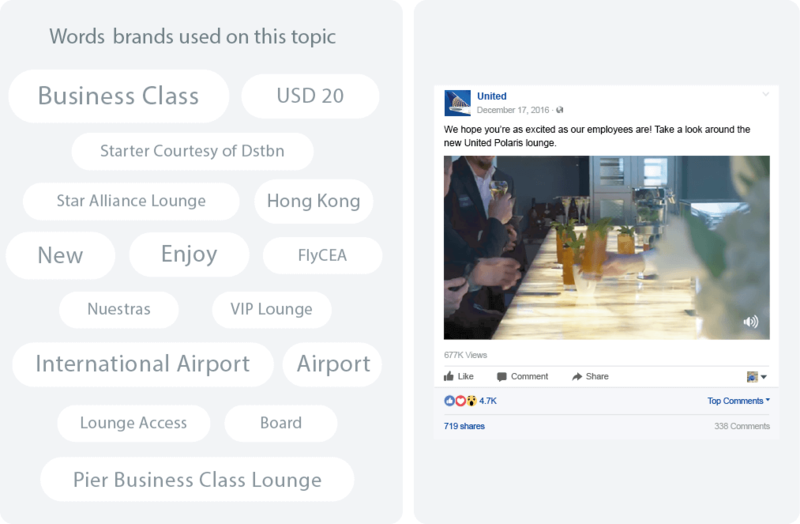 Here, United’s promoted post about its new Polaris business class lounge generated over 677,000 views and 719 Shares – more than any other business class lounge post. Twitter has long established itself as a center for customer support and the data illustrates just how important the platform is for airlines. They fielded an average of 712 mentions per day, representing an increase of 141% in user mentions per airline between 2013 and 2016. The timings when people tweet to the airlines has expanded over the years. In 2013, most user mentions were received between 12 noon and 6pm EST. Today, most mentions happen between 11am and 9pm EST. Preliminary data from 2017 suggests that there is an increase in user mentions, indicating that the trend of requesting customer support on Twitter shows no signs of slowing down. 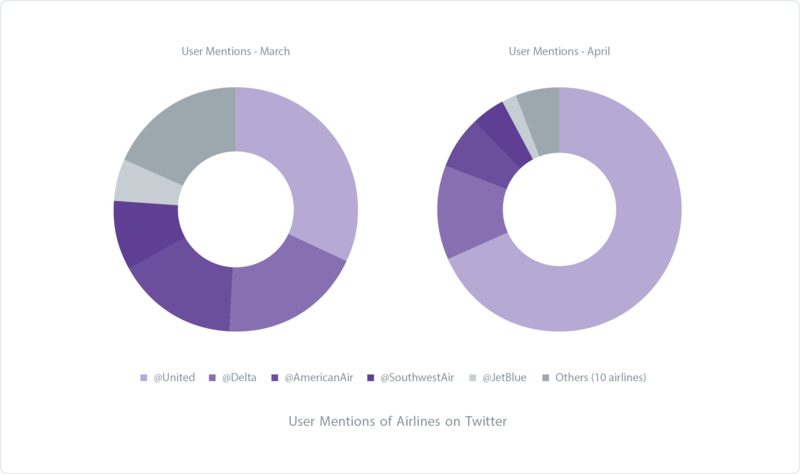 American Airlines and Delta Air Lines were responsible for 44.5% of all user mentions on Twitter in this report. They fielded 833,969 and 886,600 user mentions respectively. 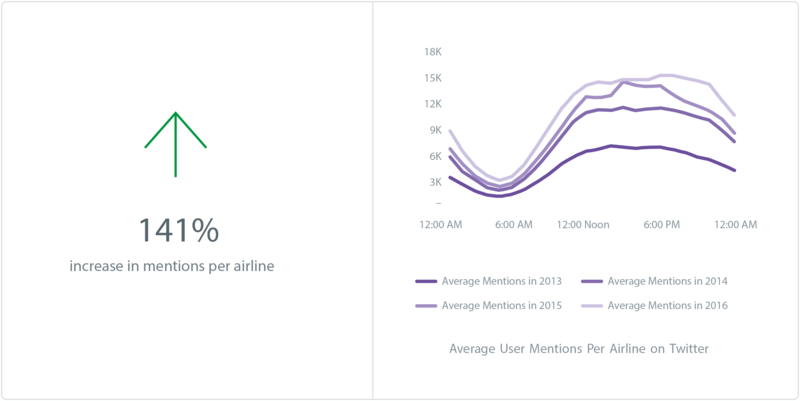 Volaris has seen a 755% increase in user mentions on Twitter since 2013 when it had 31,300 mentions. In 2016 that had risen to 267,500. As more and more users are turning to Twitter to resolve customer support issues, the average reply time of airlines has increased. In 2012, airlines were responding to 65.2% of tweets in just 15 minutes with an average reply time of 61 minutes. 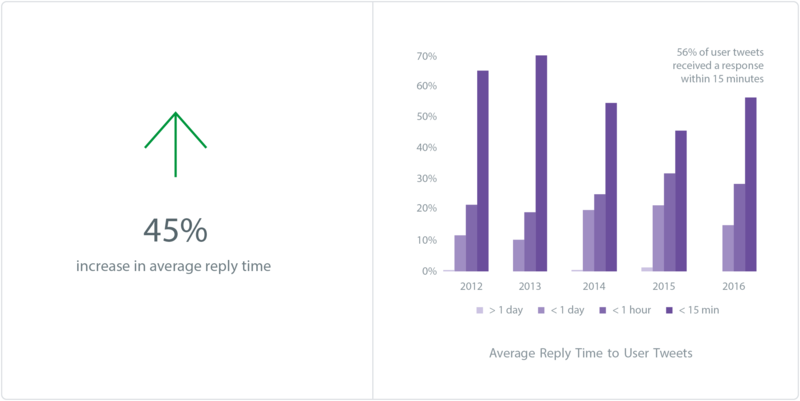 In 2016, just 56.5% of users received replies within 15 minutes and the average reply time increased to 89 minutes. In 2016, airlines responded to 36% of all user mentions, meaning that almost two thirds of users never got a response to their tweet. American Airlines continues to lead the way in terms of customer service on Twitter. In 2016, it responded to 45% of its 833,000 mentions with an average reply time of 35 minutes. Alaska Airlines had the fastest average reply time out of the airlines featured in this report. 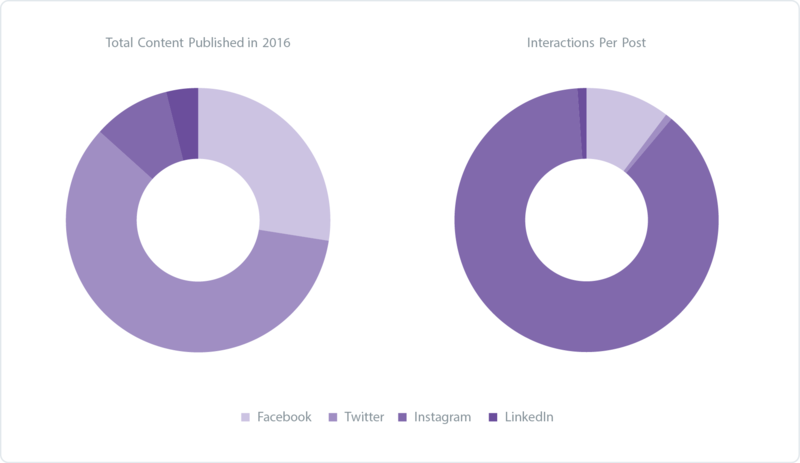 It responded to 40% of the 430,000 user mentions in an average of 25 minutes in 2016. In 2016, 13.6% of all replies sent by airlines contained an apology. This percentage has been on the increase since 2013 when just 11.6% of replies contained an apology. 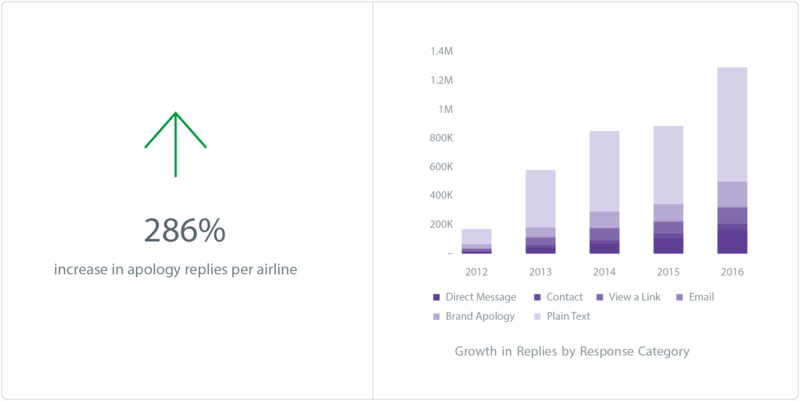 Also on the increase are airlines looking to move the conversation out of the public view with requests for the customer to Direct Message (DM) the airline growing from 7.8% of replies in 2013 to 12.7% of replies in 2016. Allegiant Air was the most apologetic airline in 2016. 22% of its replies contained an apology. American Airlines was not far behind with 19%. Spirit Airlines was the least likely to apologize. Just 1% of its 6,500 replies to user tweets said sorry. Instead, it had the highest percentage of replies (63%) looking to move the conversation to Direct Message. 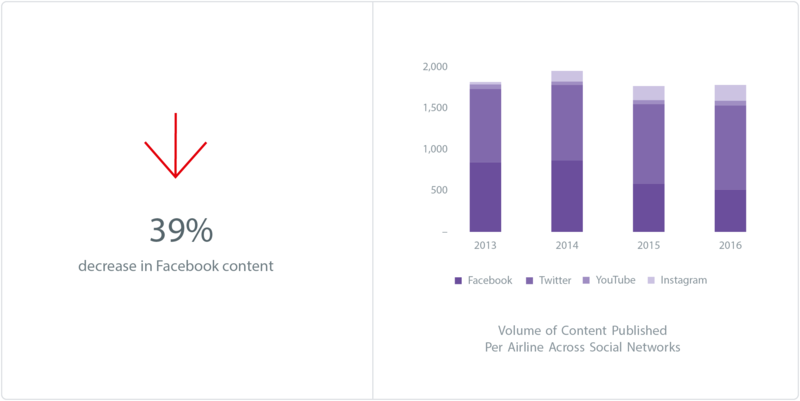 Airlines are posting less content on Facebook than ever before. In 2016, airlines posted an average of 10 posts per week. This could be for a couple of reasons: an increase in promoted content, diverting budgets for content creation to content promotion. 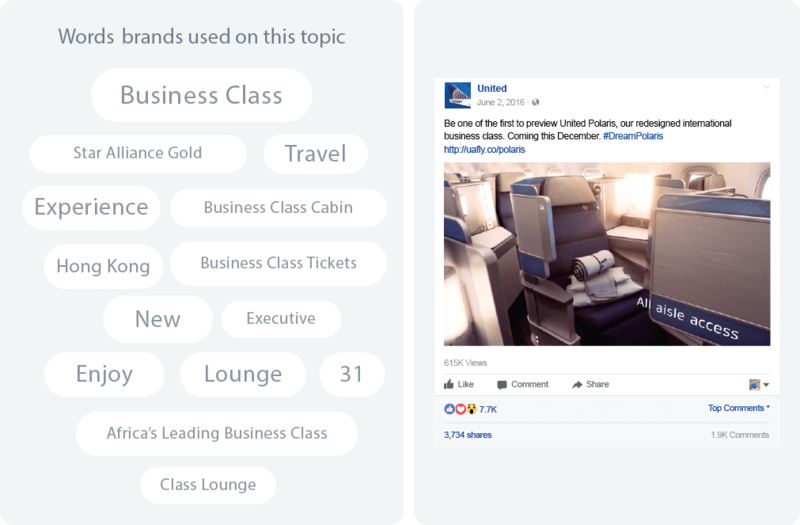 Secondly, airlines could be relying more on “dark posts”, which are posts inserted into the users’ Facebook newsfeed that do not show up on the airlines’ Facebook page. On Instagram, airlines have significantly increased the amount of content they publish. In 2013, airlines posted an average of 13 posts to Instagram, and in 2016, this had increased to 189 posts – a growth of 1,350%. 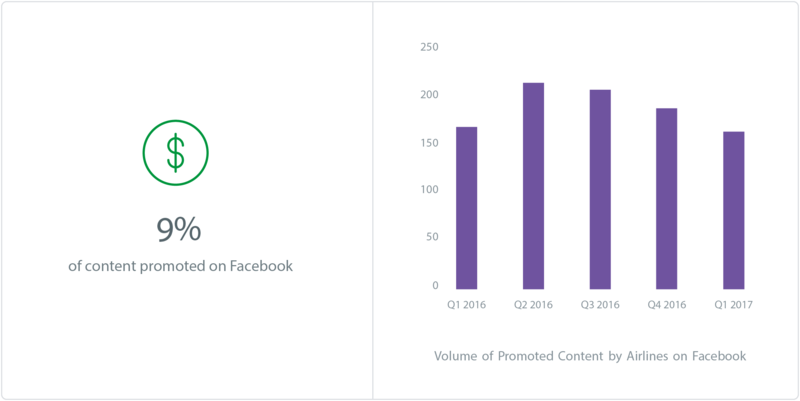 Volaris bucked the trend on Facebook by publishing more than 6 posts per day accounting for 31% of all the Facebook content analyzed in this report. 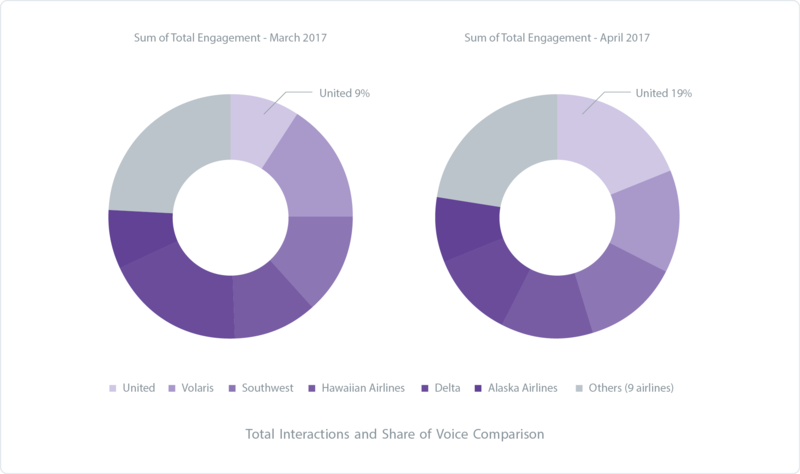 While most airlines were publishing content once every two days on Instagram, Hawaiian Airlines posted new content every single day. Despite the volume of content published by airlines dropping to an all-time low, the number of user interactions being generated on that content is at an all-time high. 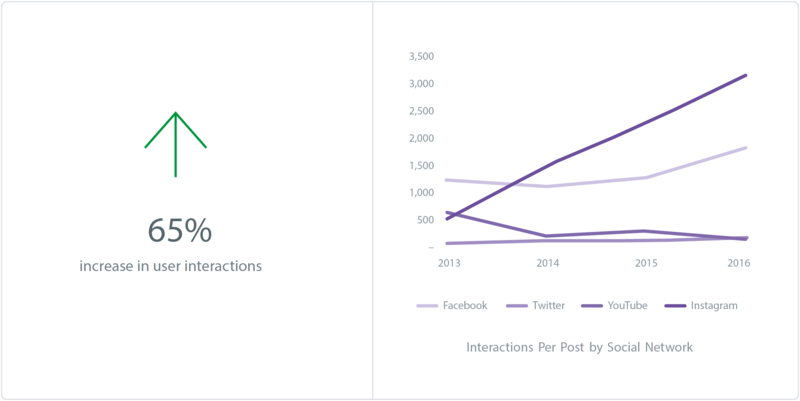 Instagram is leading the way with this increase in interactions, growing by 539% from 2013 to 2016. Today, for every interaction an airline receives on its Facebook content, it generates 1.75 interactions on its Instagram content. 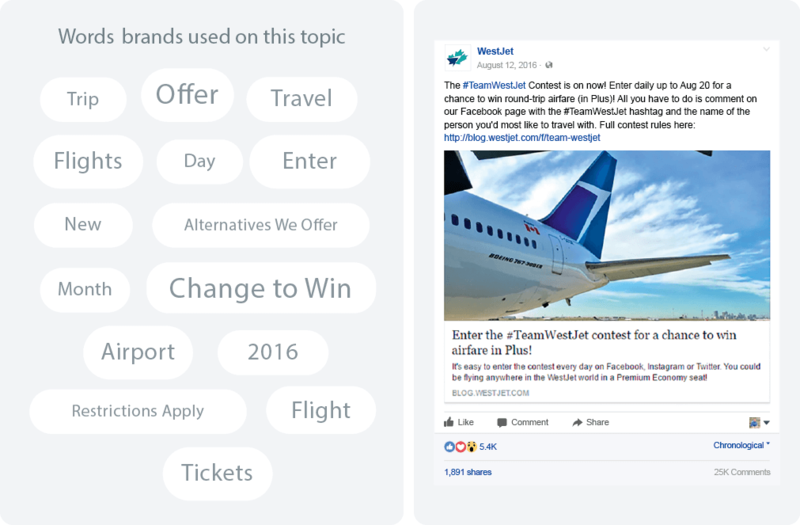 WestJet creates some of the most shareable content on Facebook. For each one of its posts, it garnered an average of 516 shares – twice the average that other airlines generated. Delta Air Lines were experts in sparking conversations on Instagram in 2016. Content published by the airline accounted for 71% of all Instagram comments for the airlines featured in this report. Given the falling organic reach on Facebook coupled with the rise in the number of interactions per post, it was surprising to see just how little publicly-posted content is being promoted by airlines. Unmetric uses algorithms and machine learning to identify which posts have been promoted with a 98% accuracy. Promotion of content peaked in Q2 of 2016, and has fallen quarter on quarter. This could be the result of seasonal trends which impact the industry but it’s still surprising to see such low numbers. Alaska Airlines had the highest percentage of promoted posts in Q1 of 2017 with an estimated 41% of their posts being promoted.